Glutamine is a nonessential amino acid that is the most abundant free amino acid in human muscle and plasma. It is necessary for rapidly dividing cells, including those of the gut and immune system. It is also used as an energy source in mitochondria, and is a precursor of the brain neurotransmitter glutamate. Glutamine is also needed for optimal nucleotide biosynthesis and protein synthesis. Glutamine is a very diverse amino acid that is utilized in numerous functions that are important for daily living. People that do heavy exercising can lower their glutamine levels causing stress to their body and immune systems. For that reason supplementing with glutamine can be an important part of a serious athlete’s program or someone challenged with loss of muscle, or just wanting to help maintain optimal immune function while under heavy stress. There is evidence that undertaking prolonged, exhaustive exercise such as running a full marathon or intensive training sessions can reduce blood concentrations of glutamine and increase the risk of infection. 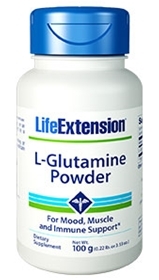 Glutamine is a nonessential amino acid that is an important fuel for some cells of the immune system such as lymphocytes and macrophages that may have specific immunostimulatory effects. Take 1/2 teaspoon daily with or without food, or as recommended by a healthcare practitioner.